To date, HEVC has been a term that’s primarily used by those in the content, broadcast and video ecosystem industries. Very few consumers know what HEVC is outside of those who are tech nerds or video quality fanatics. But that may change over time as Amazon is now promoting the value of HEVC to consumers and the impact it has on video quality. In conjunction with Amazon’s announcement of upgraded Fire TV and streaming stick hardware, the company specifically calls out HEVC on the Fire TV product page. Amazon notes that their Fire TV box is “built to support High Efficiency Video Coding (HEVC).” Amazon explains that, “HEVC is approximately 2x more efficient at encoding video than the current industry standard, which means less bandwidth is needed to deliver high-quality video streams. As a result, the majority of Fire TV customers will now experience more high-quality, 1080p streams from Amazon Video.” Interesting. To date I haven’t seen any streaming device manufacturer highlight HEVC and use it as a selling point. Most consumers still won’t pick up on what HEVC is, but over time HEVC will become a better known technology if CE manufactures highlight HEVC’s value. As much as I like what Amazon is doing in highlighting HEVC, I don’t like the confusion they are creating around 4K and over-the-air terminology. The new Fire TV box supports 4K streaming, the first sub-$99 box in the market to do so. Even the new Apple TV box doesn’t support 4K yet. And while we still have many years before 4K really matters to the public, getting more 4K capable devices in the market, at a $99 price point is a good start. But Amazon is creating some confusion around their support for 4K. 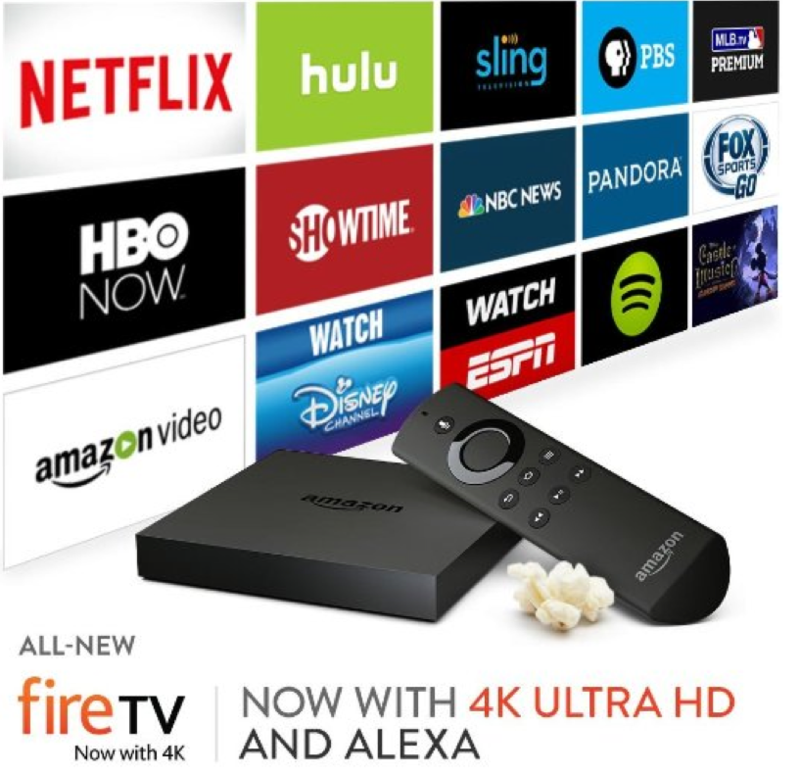 On the Fire TV page, Amazon says that the, “all-new Amazon Fire TV now supports 4K Ultra HD for true-to-life picture quality. Watch high-definition 1080p streams on Amazon Video, Netflix, Hulu and more, even without a 4K TV.” Why bring up 4K TV’s when discussing 1080p? Using both of those terms, in the same sentence will only create confusion amongst many consumers. Amazon also calls out “cord cutters” and says if you want local channels, you can “add an HD antenna to your home entertainment system.” Amazon even provides a link on the Fire TV page to an antenna you can add to your cart. Consumers will take that to mean you can add an OTA antenna to Fire TV, which you can’t. Many think of the Fire TV as their “home entertainment system”, as Amazon calls it, so why even call out HD Antenna’s when Fire TV can’t pull in or record anything OTA? All that does is add more confusion for consumers, who already have a lot of choices in the market when it comes to content services and streaming hardware.